DU B Unit Admission Question Solution 2017-18 of the year of 2017 will be found here with the correct solution. The 100 MCQ questions will be solved correctly and will be uploaded here. Admissions test of the Dhaka University KHA Unit Protection Pattern Full MCQ based admission test Analytical or theoretical question is not taken at the University of Dhaka examination. We hope that; The question is very simple comparison compared to previous years. 10% of the questions are very difficult. 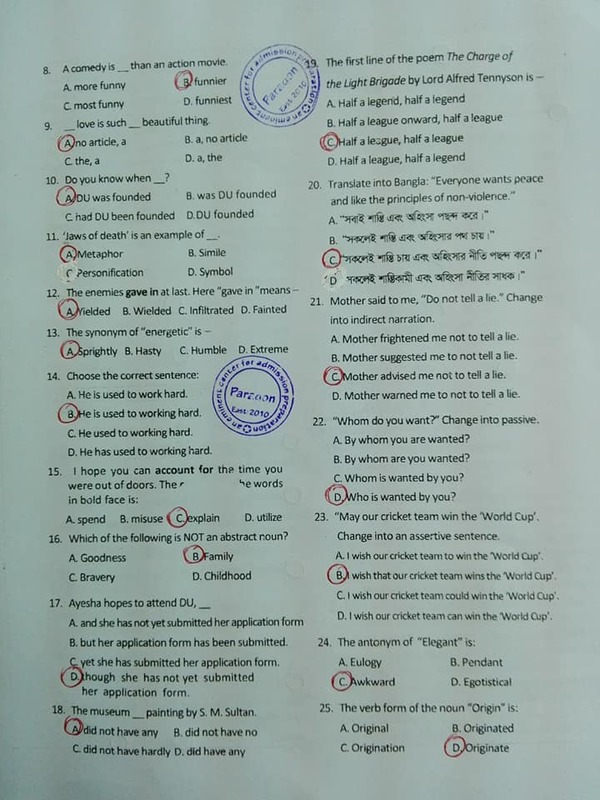 Only those extra ordinary students can solve that question, the total marks of the KHA unit test is 120, and there are four issues, Bengali-30, English-30, general knowledge-1-30 and general knowledge-2-30. Those students who are not Bengali or can not answer in their unseen English. For every wrong answer, cut 0.30 from the negative answer. There should be at least 48 marks in the examination and fewer than 8 people will be separated. Here is the previous year B unit Questions Solution. After downloading the question you will be avail to see the full exam question solution of the year of 2017-18. To get more question and solution stay with us by liking our Facebook page and visiting our website regular for more updates and notice about DU admission. Stay well. Here you go for the Dhaka University B Unit admission test question with solution for the year of 2015-16. Click here to download the full question solution of 2015-16 from here. Download Solution. To get regular such more public universities questions solution stay with our page and share our post to your timeline. You can also comment on our Facebook page at www.facebook.com/Bdresultpage or message to our Facebook page directly to contact us and to get more information about DU B Unit Admission Question Solution 2017-18 stay connected with our website at www.bdresultpage.com.